The Micron AU8115 is a self-contained vehicle mounted Controlled Droplet Application (CDA) sprayer designed for a wide range of migrant pest, public health and agricultural spraying tasks. The sprayer utilises Micron rotary cage spray technology to produce spray droplets of a precise and consistent size. The rotary atomiser is driven by a powerful airstream generated from an engine-driven blower mounted at the base of the unit. During operation, the airstream carries the spray droplets away from the vehicle and the operators. 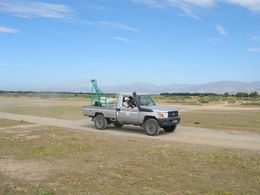 This can give an effective release height of up to 15 metres and enables a swath of over 100 metres to be achieved when using a drift spraying technique with a wind speed of 2.5 metres/second or more. Optional extension systems are available for treatment of tree locusts and quelea or for mosquito larviciding. AU8115E incorporates an electric in-cab controller. This provides a choice of ten pre-set flow rates from 0.2 - 2.5 litres per minute, thus eliminatingthe need for manual calibration of the flow rate. The engine throttle is electrically operated from a switch on the control box. AU8115M is supplied with a manual in-cab control box with a hand operated lever to control the engine throttle and a switch to operate the pesticide pump. Flow rate can be set by in-line orifice restrictor plates or by an adjustable flow control valve. 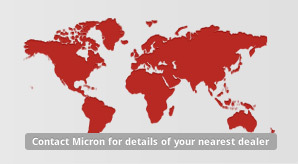 The Micron AU8115 has a proven track record in locust control having been used in recent programmes to control the Desert Locust (Schistocerca gregaria) in Africa and the Middle East, Italian and Moroccan Locusts in Central Asia and Oriental migratory locusts in the Caucasus and Central Asia. The Micron AU8115 can treat up to 500 ha in a single day using conventional contact insecticides, stomach poisons, insect growth regulators (IGR's) or newer environmentally benign biopesticides such as Metarhizium fungal pathogens. High work rates, efficacy, ease of use and safety are essential features of the Micron AU8115 sprayer that are internationally recognised by locust control organisations in many countries. The Micron AU8115 was rated best in its class in a recent workshop organised by the UN FAO to evaluate the suitability of locust control equipment. 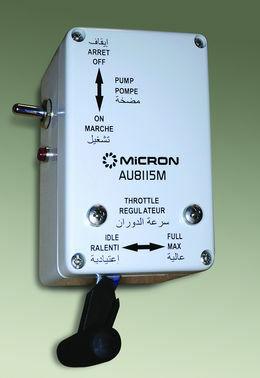 The Micron AU8115 has been widely used for both adulticiding (to control adult flies and mosquitoes) and larviciding to control mosquito nymphs in open water or in drainage canals. The powerful airstream and precisely controlled droplet size allows for the space treatment of expansive urban or residential areas with typically up to 3 - 5 Km2 treated in a single evening. The spray can be projected to a height of up to 15m, ensuring targeting of the most inaccessible areas with an easily adjustable spray head. High work rates, ease of operation and safety of operators makes the Micron AU8115M a highly versatile sprayer for the control of the vectors of many important public health diseases, allowing health authorities to intervene rapidly to prevent the spread of disease. 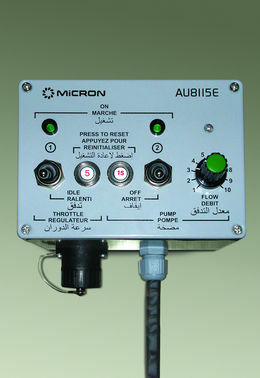 The Micron AU8115 is also used to control insect pest infestations in field crops such as cotton or wheat. The Micron AU8115 has been deployed to control severe outbreaks of cotton bollworm, Helicoverpa armigera and has been used in programmes to eradicate the cotton boll weevil. Timely and rapid intervention is possible due to the capability to spray at ultra low or low volume rates with droplet sizes optimised for deposition on plant foliage. The Micron AU8115 sprayer has also been widely employed to control Sunne Pest (Eurygaster integriceps) in Central Asia and the Near East in wheat crops where up to 50 ha/hour can be treated to prevent damage to the grain. 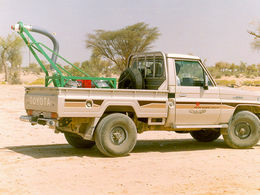 The sprayer is also used for routine bird control (Quelea species) in Eastern and Central Africa to protect cereal crops from devastating damage by large flocks of birds. The Micron AU8115 can target roosting sites by propelling spray high into trees in late evening. An optional mast extension is available to increase spray height. 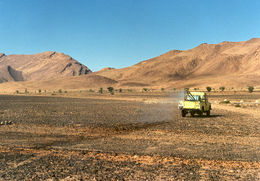 Insect pests in plantations can also be targeted efficiently where vehicular access is possible. Applications of contact acting pesticides, insect growth regulators and the biopesticide Bacillus thuringiensis (Bt) have been successfully made with this sprayer. Where vehicle access is not possible control can be undertaken with the portable Micron AU8000 back mounted sprayer, which utilises the same rotary atomiser technology. 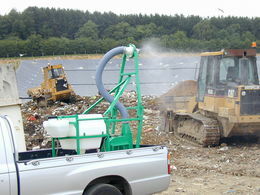 The Micron AU8115 is used for routine nuisance fly control in waste disposal sites, landfill and refuse areas. The powerful airstream can disperse spray up to 100 m with a suitable wind to control adult flies. It can also be used to apply insect growth regulators and other products to treat soil or refuse directly to control insect larval stages. The Micron AU8115 can be fitted with an optional extension tube for the treatment of drainage ditches, sewers or other difficult to reach areas. We also offer Spraytrac precision guidance and reporting system developed specifically for vehicles used for migrant pest spraying. For more information, please download the GPS Handbook below.